“We are delighted to see the PCI SCC’s latest guidance which provides greater clarity on the measures businesses need to take to ensure they protect consumers, de-scope their contact centre environment, and remove their business risk in this area. Ultracomms has pioneered an industry-leading solution called PaySure. The solution allows customers to enter their payment card numbers directly into their telephone keypad, removing the risk of a card data breach that could occur reading them out loud to a contact centre agent over the phone. Ultracomms has also produced a free downloadable guide to help businesses comply with PCI DSS. Ultracomms is a leading provider of PCI DSS level 1 certified secure payment handling and omni-channel customer contact management solutions. Its advanced customer interaction and secure payment solutions are designed to help clients maximise contact centre performance, improve customer experience, simplify compliance process and reduce organisational risk. Ultracomms was the first provider of contact centre solutions using cloud technology in Europe and today handle nearly 100,000,000 minutes of calls every year for customers over our PCI DSS level 1 certified omni-channel customer contact platform. 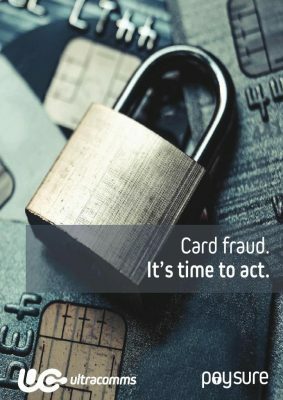 Ultracomms has been PCI DSS level 1 certified since April 2016 and today securely processes over £30m of card transactions a year for its customers.